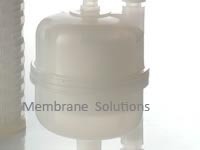 MS® specialise in design, production, supply of membranes, filtration, and separation products. Our capsule filters meet your needs in different fields, including the biosciences, industrial processing, laboratory testing, food & beverage, electronics and water treatment. Considering different applications require specific capsule filtration devices for different needs, Customizing is our mainly service in this item, Welcome to tell us your requirement, We will design unique device only for you.